Once a year, a flock of thousands of Vaux (pronounced "vawks") Swifts come to visit Chapman Elementary School in Portland OR, swirling and flying into the chimney of the school nightly for a couple of weeks. Thousands of onlookers picnic and watch the swifts as they fly about. During the peak of the swifts' annual migration from the Pacific Northwest to wintering grounds in Central America and Venezuela, an estimated 35,000 may roost together in the Chapman chimney, the largest known Vaux's swift roost in the world. 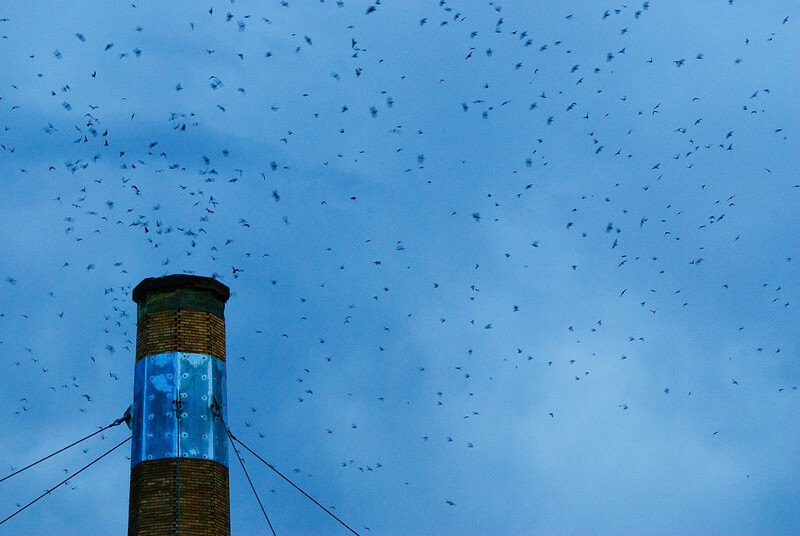 Once a year, a flock of thousands of Vaux Swifts come to visit Chapman Elementary School in Portland OR, swirling and flying into the chimney of the school nightly for a couple of weeks. Thousands of onlookers picnic and watch the swifts as they fly about. During the peak of the swifts' annual migration from the Pacific Northwest to wintering grounds in Central America and Venezuela, an estimated 35,000 may roost together in the Chapman chimney, the largest known Vaux's swift roost in the world.